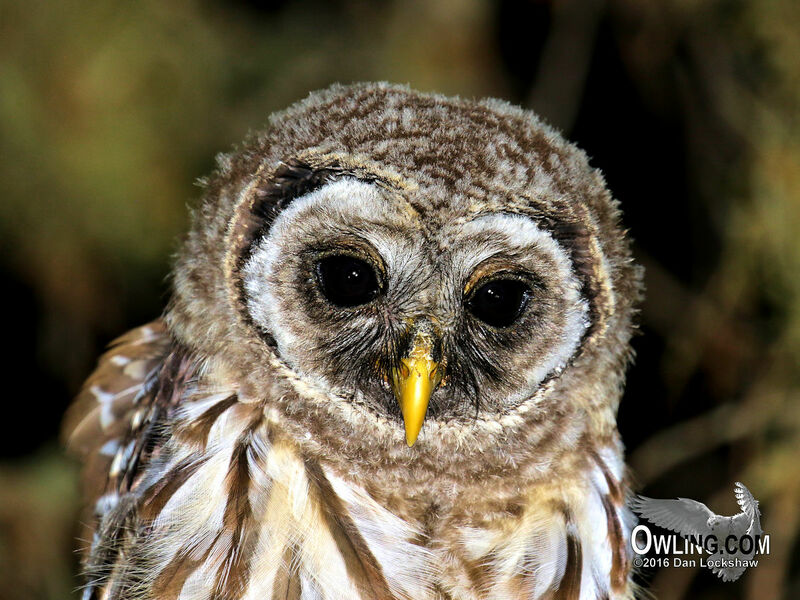 Subspecies: There are three subspecies of the Barred Owl in the United States and Canada. There is also a fourth subspecies found in Mexico. S. v. varia is the most widespread. It ranges from NW California north to SE Alaska east across Canada, C & E USA (S to N Texas and North Carolina). S. v. georgica is spread across the SE US from Georgia and Florida W to E Texas. S. v. helveola is resident in southern Texas. S. v. sartorii is resident in C Mexico. Wingspan: 40 – 50 in. Length: 17 – 24 in. Tail: 8.5 – 10 in. Average Weight: Male: 1.4 lbs. Average Weight: Female: 1.8 lbs. Description: A medium to large sized owl lacking ear tufts. Male and female are identical in plumage. Head, neck, chest and most upper parts are buffy-white with dark brown barring. The lateral barring of the throat and upper chest sharply break between the vertical streaking of the lower breast and flanks (This is also a very good field mark to distinguish the Barred Owl from the very similar Spotted Owl). The dark brown back is spotted with white; facial disk is grayish white or pale brownish-gray with 4 to 5 concentric semicircular brown rings and the tail is crossed with 6 to 7 sharply defined bands of pale brown. The bill is greenish-yellow to dull buff-yellowish; iris is deep brown to brownish-black; legs and toes feathered buff-white. The talons are dark horn become black at tips. The Barred Owl’s highly distinctive advertisement call, described as “Who cooks for you; who cooks for you all?” or “You cook today; I cook tomorrow”, is the simplest method of finding and identifying this owl. Young: At first the young are covered with pure white down. A second longer downy coat that is buffy at the base and white on the ends replaces this after a couple of weeks. The head neck and under parts are barred, at this point, with light brown; wing coverts and scapulars are barred also but with broader bars of deeper brown and white tipped feathers. By the first winter the plumage becomes more adult like. The Barred Owl’s habitat is characterized as heavy mature woods with nearby open country for foraging. These vary from upland woods to lowland swamps usually near creeks, lakes or river valleys. The area should include densely foliated trees for daytime roosts, conifers or deciduous trees with year around leaves for winter roosts and the presence of large trees (at least 20 in. in breast-height diameter) with suitable cavities for nesting. The habitat, in elevation, runs between sea level and (in Mexico) 8000+ ft. 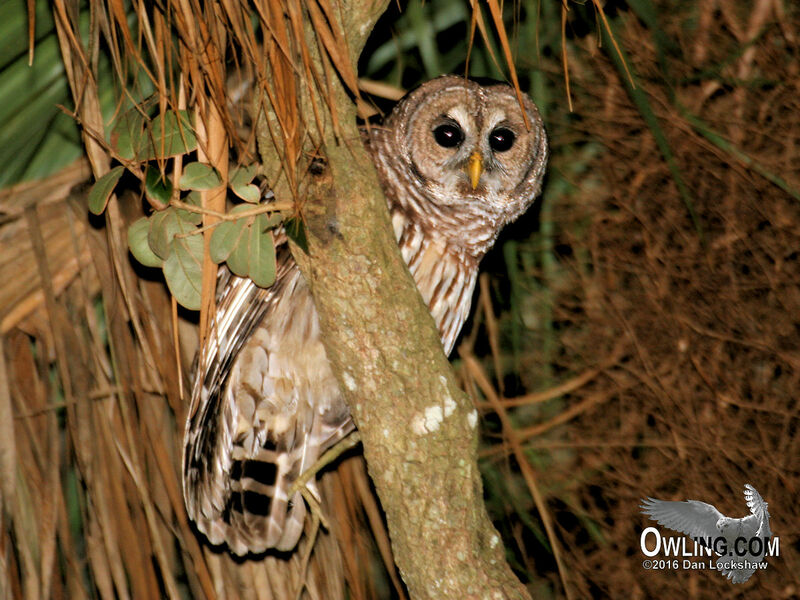 The Barred Owl has an extremely varied diet composed mostly of small mammals, especially small rodents, along with a good percentage of birds. Prey also includes arthropods, fish, reptiles, amphibians, and invertebrates. Birds up to the size of grouse, domestic foul, pheasant, partridge and even smaller owls (up to and including records of Long-eared Owls) will be taken. Mammals taken include voles, mice, shrews, squirrels, wood rats, rabbits, opossums, chipmunks, hares and bats are commonly taken. Other prey includes snakes, frogs, lizards, salamanders, mollusks, insects, and has also known to have mastered fishing. The Barred Owl is clearly an opportunistic forager taking whatever is available to them and within their power to overwhelm. 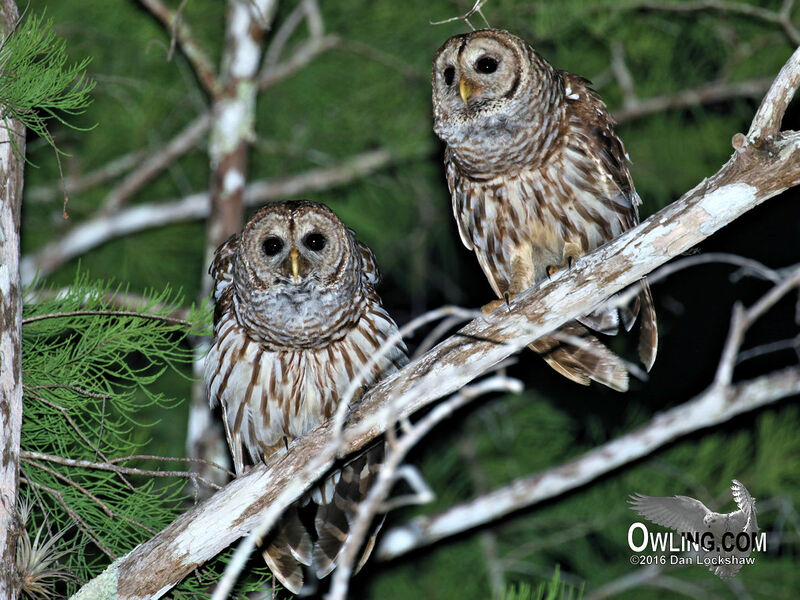 Their diet is virtually identical to their close but smaller relative the Spotted Owl (Barred Owl is 17-24 inches in length and the Spotted Owl is 16.5-19 inches) giving it an advantage where the territories have begun to significantly overlap in recent history. The breeding season for this species is fairly long and may last from Feb.-Aug. depending on the region. Renesting is common if the eggs or brood is lost and even a third set is possible after the loss of the second set. 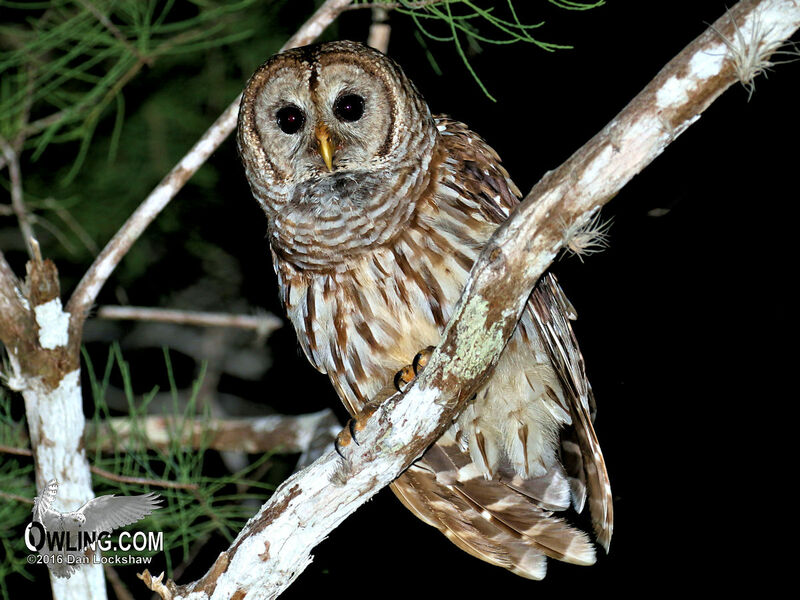 The Barred Owl is monogamous and probably pairs for life. Nest sites are most commonly in hollows of old trees but they may also use abandoned hawk or crow’s nests. Clutch size is usually 2 to 3 eggs and the incubation, exclusively by the female, lasts 28-33 days. At about 4-5 weeks old the young begin to leave the nest to nearby branches but do not fledge until they are about 6 weeks old and may additionally receive food from the parents for as long as 4 months. The Barred Owl is almost always resident year round except during exceptionally harsh winter conditions or possibly depending on prey availability. The lifespan of captive owls has been documented as long as 23 years.